a free virtual WiFi router software, can convert your Windows XP, 7 & 8 laptop/PC into a WiFi Hotspot with one click. You can easily share the internet connection and video with your friends and peers anytime and anywhere. The main features of My WIFI Router: 1. 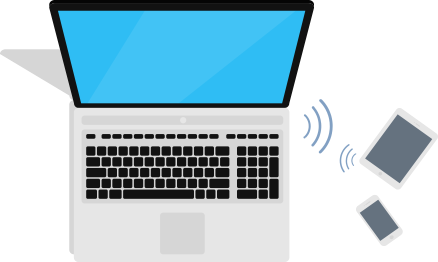 Easy to create a secure wifi hotspot on your PC, and the hotspot's name, the passport and the sharing mode is customizable; 2. You can share all sorts of internet connection ( such as LAN, Ethernet, Data-Card, 3G/4G, Wifi ) for other portable devices; 3. It is clear and easy to get the details of the connected device(Name, Ip Address, Mac Address), and also manage the devices: Black it; Release it; Limit the Network Speed. 4. Free to Share Videos over WiFi: Easy to share and play your computer's videos on other devices including smartphones, tablets & laptop, what's more important is everybody can control the video broadcast speed individually; 5. Extends your Wifi range. Highlights of My WIFI Router: 1. The signal of the wifi hotspot created by My WIFI Router is stronger than other software. 2. It runs stable and occupies less memory. 3. It is easy to create a wifi hotspot, just 3 steps: Open the software -> Input the name and the password -> Click the "Start" Button. 4. Manage the connecting devices:Rename it; Black it; Release it; Limit the Network Speed. 5. Free to Share Videos over WiFi: Easy to share and play your computer's videos on other devices including smartphones, tablets & laptop, what's more important is everybody can control the video broadcast speed individually. 2.1 Manage the connecting devices:Rename it; Black it; Release it; Limit the Network Speed. 2.2 Free to Share Videos over WiFi: Easy to share and play your computer's videos on other devices including smartphones, tablets & laptop, what's more important is everybody can control the video broadcast speed individually.